UKZN Neuroscience Team out and about for Brain Awareness Week. 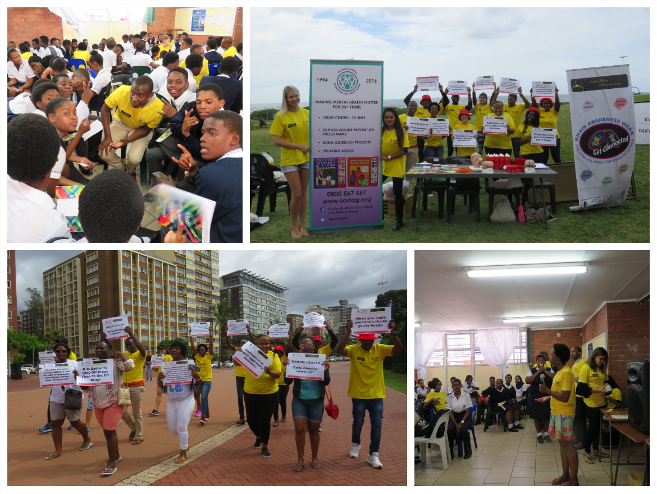 A UKZN Neuroscience team organised a variety of activities for Brain Awareness Week (BAW) from 12- 18 March. Held world-wide, the annual event is the brain child of the Dana Alliance for Brain Initiatives and the Society for Neuroscience to promote the public and personal benefits of brain research. Under the leadership of Neuroscientist, UKZN DRILL Fellow and lecturer Dr Lihle Qulu, the team started off the week on the Howard College campus where they addressed students on mental health on issues such as the importance of healthy lifestyles, correct dietary intake, effective and sensible study skills and stress management strategies. Qulu illustrated the practical application of neurophysiology to enhance study efforts. ‘We explained how memory is formed when learning and how repeating information and healthy sleeping habits assist memory consolidation and recall during an examination. ‘Drug addiction is rife in modern day society, with our youth being vulnerable targets, yet few realise the deleterious effect of drugs of abuse on the very structure and functioning of the brain. ‘We also spoke to students about the research conducted at UKZN on the impact on the brain of a diverse array of social and clinical diseases including Parkinson’s, autism spectrum disorders, febrile seizures, and the impact of schistosomiasis on the brain during early childhood development,’ said Qulu. The Neuroscience team visited Overport Secondary School in Durban where they addressed learners on the impact of stress on the brain and how stress affects learning and memory. They spoke about the difference between stress and depression and how to identify these conditions and where to get help and treatment. ‘We emphasised the brain-damaging effects of drugs and the link between short-lived highs and the long-term damage suffered by the brain,’ said Qulu. Team members also outlined opportunities for careers in neuroscience and demonstrated the link between laboratory-based experiments and everyday life. The highlight of the week was a 5km walk along Durban’s beach promenade during which UKZN Psychiatrist, Dr Suvira Ramlall and members of the KZN Mental Health Advocacy Group and the South African Depression and Anxiety Group (SADAG), spoke to the public about brain and mental health.